Christmas flew by didn't it? I felt like it lasted literally a second and it's gone and dusted. With my Obsession with Yankee Candles only started sinking in within the last month or so, The Christmas scents where the first of many to have been in my cart. For my First Full Sized Medium Jar, I was torn between Merry Marshmallow and Christmas Cookie. Having both Wax Tarts in both scents I finally came to a decision and Christmas Cookie was a winner. It's buttery scent with vanilla and a smell of baking and cookies, I just fell in love with this candle. 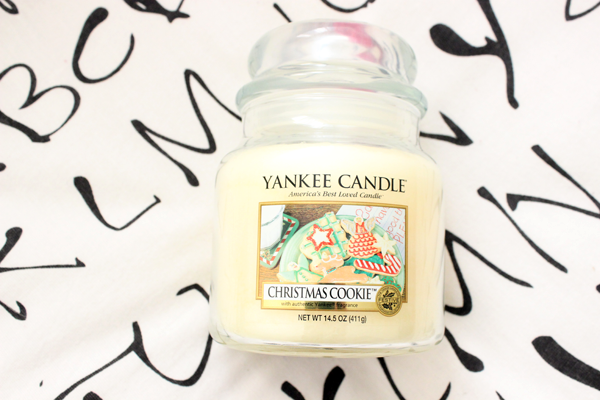 I tend to burn it for about an hour or so when I'm blogging or editing and it just fills the room with this vanilla cookie scent. Don't you just love the aroma and the relaxation when candles are burning around you? I feel like it's my little bubble. WHICH SCENT ARE YOU LOVING? SHARE AND LET ME KNOW IN THE COMMENTS! I love this scent, it's so yummy!